Just like the peonies, our hellebores have been a bit confused this year and started growing and flowering earlier than expected. We welcomed the drooping cup-shaped flowers with open arms, enjoying the sight of the numerous stamens and nectarines that make them so attractive for the wildlife. Helleborus foetidus is an evergreen perennial growing to 80 cm, with a thick stem and very glossy leaves. It is grown ornamentally because of its handsome evergreen foliage and the peculiar inflorescences. It prefers woodland conditions with deep, fertile, moist, humus rich, well-drained soil, and dappled shade. 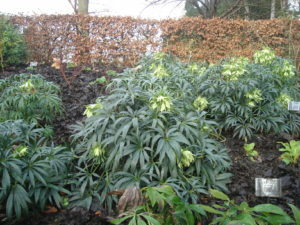 Helleborus foetidus has gained the Royal Horticultural Society’s Award of Garden Merit (AGM). Several different cultivars have been selected; it is worth to remember the names, ‘Green Giant’, ‘Miss Jekyll’, ‘Wester Flisk Group’, and ‘Sierra Nevada Group’. Despite the common name, this plant is not noticeably malodorous, although the foliage is pungent when crushed. All of its parts are poisonous though containing glycosides. Symptoms of intoxication include violent vomiting and delirium.